Photo by: Nicole Napodano. Used with permission. NCRA members from across the nation have been responding to the call to support the future of the court reporting and captioning profession by sponsoring student memberships. 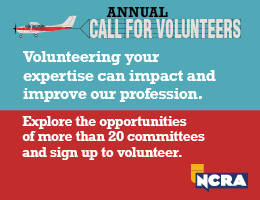 Currently, nearly 300 students want to join NCRA and benefit from membership. 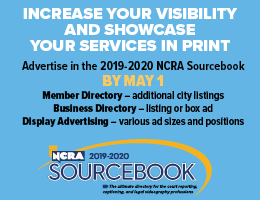 In recent months, NCRA leadership visiting state events have successfully generated many sponsorships needed by talking with members face-to-face. In addition, NCRA member Christine Phipps, RPR, owner of Phipps Reporting in West Palm Beach, Fla., launched a second call to action via the Association’s managers’ email list. Combined, the efforts have helped provide memberships to more than 100 waiting students. For many students, typical daily expenses combined with the cost of tuition make joining NCRA difficult. 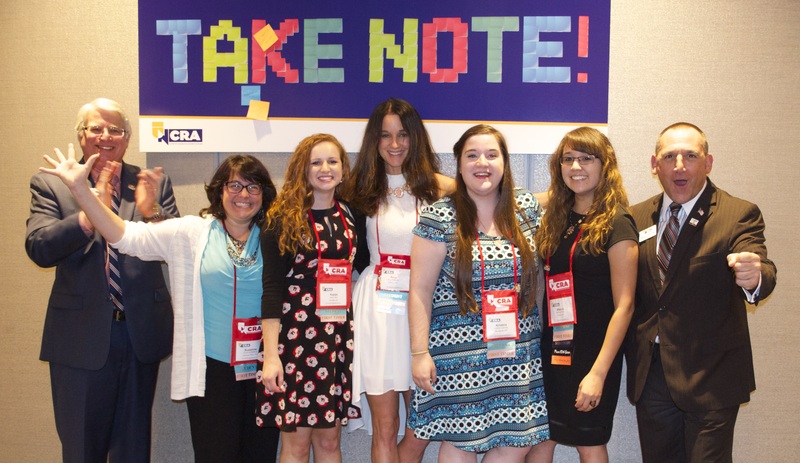 Often when students choose which bills to pay first, membership in NCRA falls to the bottom of the list, despite the fact that being a part of the national association provides numerous resources, such as access to professionals for support and other benefits that can help lead to professional success. Phipps’ first call to action came in April after attending an NCRA Board of Directors meeting where she heard that there were, at that time, nearly 70 student court reporters waiting for available funds to become members of the Association. Immediately upon returning home from the meeting, she put together a student sponsorship application, wrote a heartfelt note about what she heard and about how her firm would sponsor 10 student members, asked members if they were willing to pay it forward, and emailed it to NCRA’s managers’ email list. Within hours, the response was overwhelming, exceeding the number of pledges needed to purchase memberships for the waiting students. Back then she said the news made her recall her days as a young reporter when she couldn’t afford to join NCRA despite longing for the opportunity to meet working reporters and learn as much as she could from them. Her latest drive was inspired by those same memories as well as the overwhelming outcome of her first outreach effort. “I as a person reached out because I am just not capable of turning my back on anyone, no matter what. I believe in this cause and believe that a person’s actions speak louder than words. For so many to have put forth their actions in response to student membership makes me just so proud to be a colleague to all these great firm owners across the country. They are truly amazing people,” Phipps said. 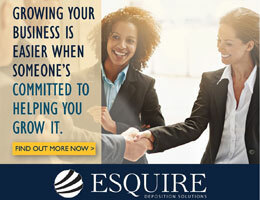 “I supported the call to sponsor a student membership because students are our future,” said Shirley P. King, RPR, CLVS, owner of King Reporting & Video Conferencing Center in Melbourne, Fla. “Thirty-five years ago I was writing on a manual machine, dictating my transcripts for a typist who used carbon paper for copies. I was asked then what are you going to do once tape recorders took over,” she said. “My answer has always been the same. We will use whatever tools are available to make the record. But court reporters are still the most cost-efficient method of making a record. Nothing beats our computer brain. And today, there are so many different avenues for court reporting now with broadcast captioning and CART — a testament that the skill is still recognized as the best speech to text method going,” King added. NCRA Immediate Past President Sarah Nageotte, RDR, CCR, CRC, Jefferson, Ohio, said that one of the greatest benefits she has experienced through her volunteer service with the Association has been the opportunity to spend time with the profession’s future: students. She recently represented NCRA at the North Carolina Court Reporters Association’s annual convention where she was also successful in generating several student member sponsorships. “There is no lack of mental and emotional support for our court reporting and captioning students. 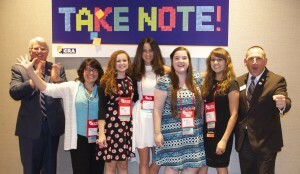 At state conventions, the applause when the students in the audience are identified often brings tears to my eyes,” she said, and further noted that she recognizes that gaining students’ ongoing membership and full participation can be a challenge due to the expenses of school and life in general. “Thankfully, my fellow reporters and captioners share the enthusiasm for our future, which makes seeking sponsorships and donations toward student memberships one of the most rewarding tasks I have enjoyed over the years,” said Nageotte. Student sponsorships cost $65 each and will cover membership costs for the remainder of 2015 through 2016. NCRA also provides a graduated cost to help assist students just out of school with maintaining their membership. Once the need for sponsorships is met, additional funds raised will be placed in a rolling program and used for other students who want to join. More information about how you can sponsor student members is available at NCRA.org/StudentSponsor.